We can categorize trading orders in four basic types: Market, limit, stop market and stop limit. Each of these four types can be a buy or a sell order. When entering a market buy or sell someone will buy or sell at market prices. This order will be executed 100% and instantly, as long as there is a market (buyers & sellers). 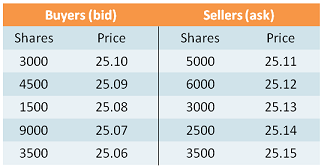 The above table presents the buy and sell prices of a stock. The first row is the market price which matches the highest bid (buyer price) and the lowest ask (seller price). The next rows (price levels) are buyers and sellers that are following. A market order will take place at the first row. A market sell will be executed at 25.10 where they are buying and a market buy will be executed at 25.11 where they are selling. Notice that we buy where they sell and we sell where they buy. The difference between bid and ask price is called spread. At row one the spread is $0.01 ($25.11-$25.10). Notice that as we get further away from row one, the spread is rising, making buyers and sellers more difficult to reach an agreement (trade). Limit buy means “don’t buy above this price” (upper limit). A limit buy of 1000 shares at 25.06 tells the trading software “don’t buy if the market price is above 25.06”. So if price at row one is 25.10 the order will not be executed. Instead it will be added to the other orders already being at 25.06 and we will have 4500 shares at 25.06 instead of 3500. But what happens if market price is below 25.06? It will be instantaneously executed like a market order because the trading system perceives that it is to the trader’s interest to buy at a lower price. Limit sell on the other hand means “don’t sell lower than this price” (lower limit). A limit sell of 500 shares at 25.13 tells the trading software “don’t sell if the market price is below 25.13”. So if price at row one is 25.11 the order will not be executed. Instead it will be added to the other orders already being at 25.13 and we will have 3500 shares at 25.13. But what happens if market price is above 25.13? It will be instantaneously executed like a market order because the trading system perceives that it is to the trader’s interest to sell at a higher price. The stop market order is a stop loss order meaning that it can protect us from having big losses when the position is moving against us. It is “sitting” in the system and gets triggered when stock price reaches the price of the stop. When triggered it becomes a market order and it instantaneously closes the position at market prices. We put a stop buy when in a short position in order to be protected from upward movement and a stop sell when in a long position in order to protect ourselves from downward movement. Stop limit order is a combination of a stop and a limit order. So we have to define two different prices, one for the stop and one for the limit. It is not a stop loss order because it can only partially executed or even not at all. When the stop gets triggered it becomes a limit order and in that case everything that we have said about limit orders can be applied. Remember that if I put a limit buy above market price the order will be executed instantaneously but if I put a stop limit buy above market price the order will not be executed until market price reaches the stop price. IOC means “Immediate Or Cancel”. So if I put an IOC buy for 1000 shares but only receive 600, the order for the rest 400 will be canceled immediately. FOC means “Fill Or Kill”. This order will be fully executed or otherwise canceled (killed). GTC means “Good Till Canceled” and it denotes that a certain order must be active until canceled.